The dining table is the beating heart of a home. It's where family and friends come together to eat and unwind, whether it's a weekday supper, weekend feast, family get together or dinner party. 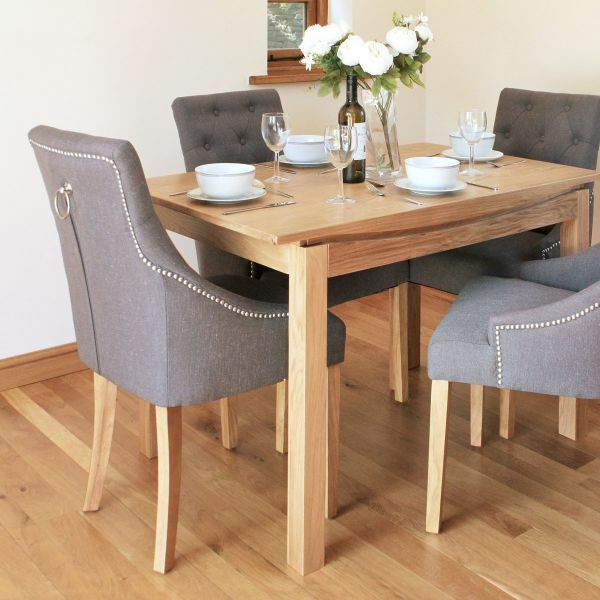 Whatever the occasion, make every meal memorable with designs from our extensive collection of solid wood dining tables and a range of matching chairs, benches and complementary dining furniture. 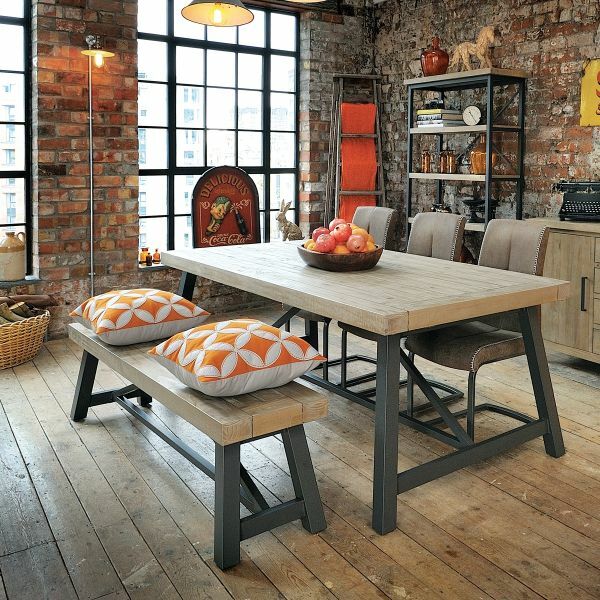 We’ve given traditional styles a modern twist so they suit a snug cottage or industrial style loft apartment. 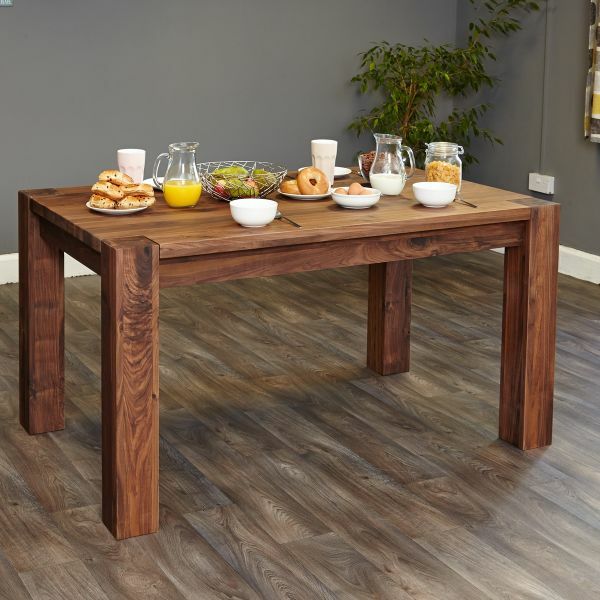 Hard-wearing and extremely versatile, our dining tables stand the test of time and are perfect for everything from birthday tea parties to work meetings and intimate suppers for two. 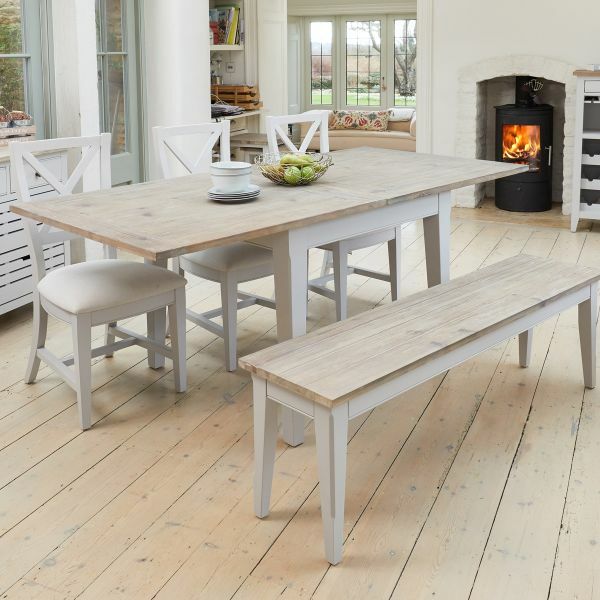 Whether you're looking for an oak dining room table and chairs to seat eight or a stylish zinc topped table for your kitchen, we have more than ten stunning ranges that will ensure your dining area is perfect. If you're after something a bit different, why not try our collection made from reclaimed timber sourced from Southern India? Each piece is made by hand and is completely unique. 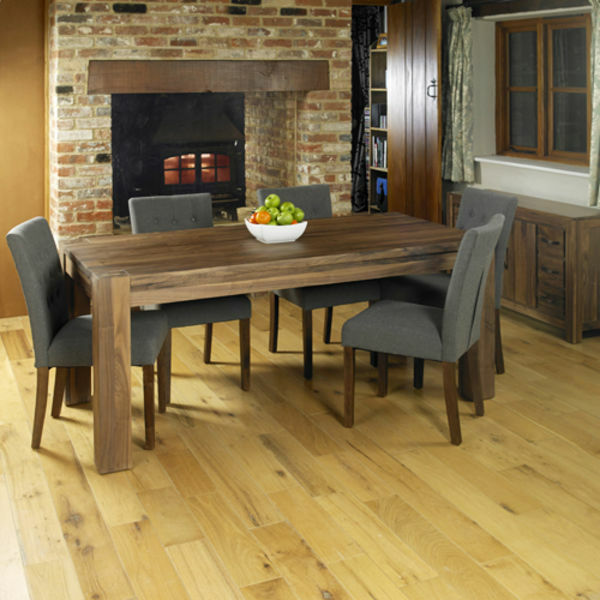 Or for a more traditional finish, our walnut dining room furniture showcases the beautiful natural dense grain of the wood alongside classic styling. 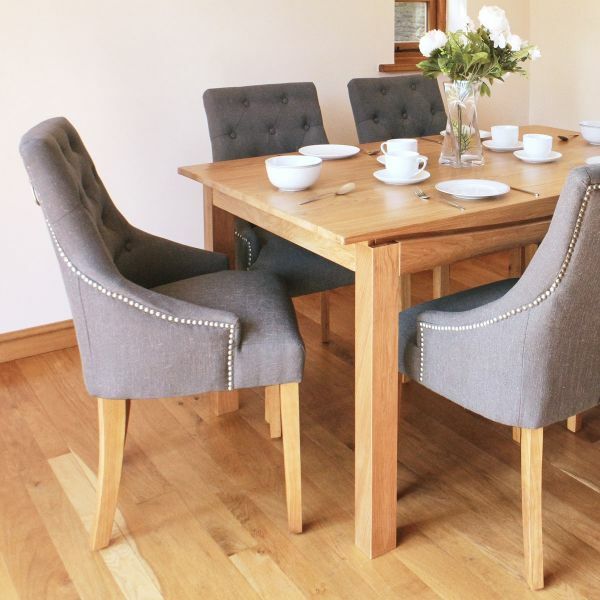 All of our walnut and oak tables are complemented with a range of perfectly matching chairs. With four different designs to choose from, each is upholstered in stunning, hard wearing fabric with button and stud detailing for that extra finishing touch. 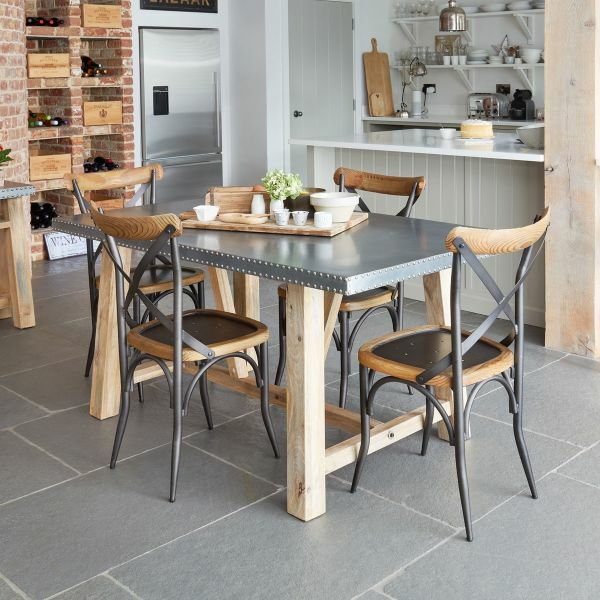 Browse our wide selection of pieces to start creating the dining space of your dreams and don't forget to check out our blog for hints and tips on how to create a perfect dining room. 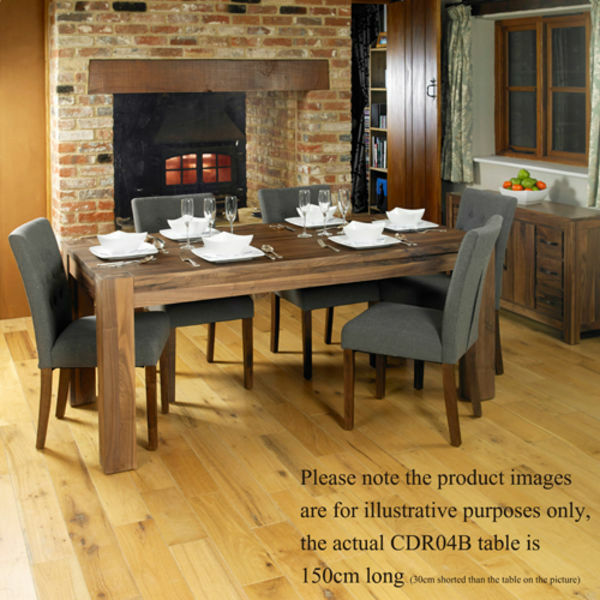 How do you decide on the right dining table for you? 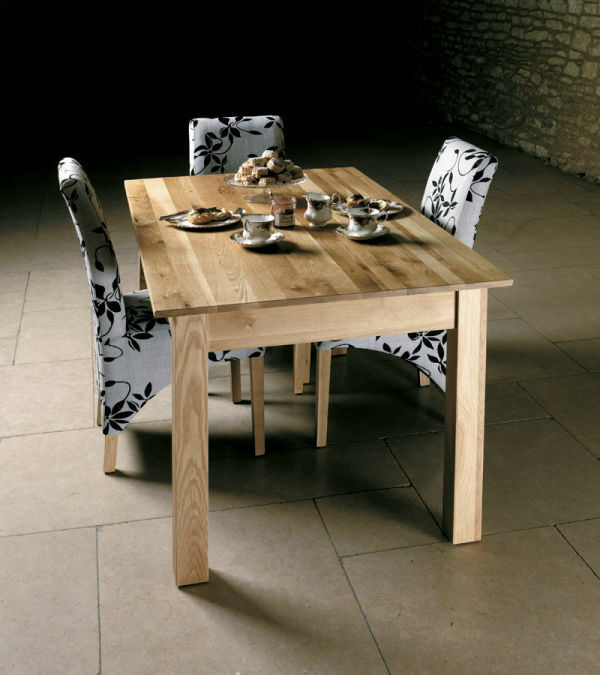 It can sometimes be a challenge, too small a table and it can feel marooned, too large and the space will feel cramped. 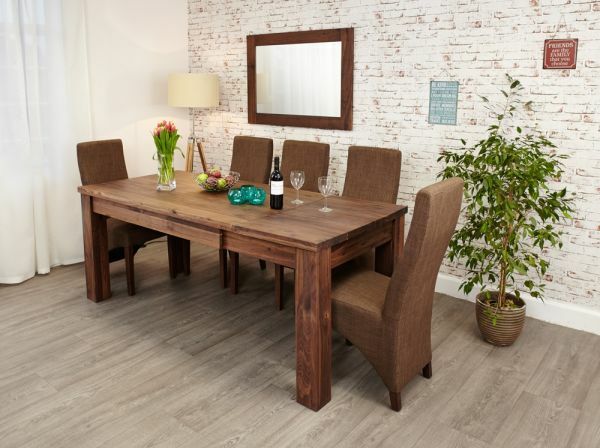 There's dining room furniture to suit every size home at The Wooden Furniture Store from dark or light oak dining tables to seat four to tables that can seat up to ten. A rectangle is the most popular shape of a dining room table because most dining rooms are also rectangular. If you are a frequent entertainer, perhaps an extendible table suits your needs better than fixed length? Square dining tables are also a good solution if you don’t have a large group to seat the majority of the time. Square and rectangular tables can also be lined up neatly with other furniture and can be pushed against the wall if you need additional space in the dining area. For extra-small or corner spaces, consider a round table which is easier to navigate around and takes up less space than one with corners. 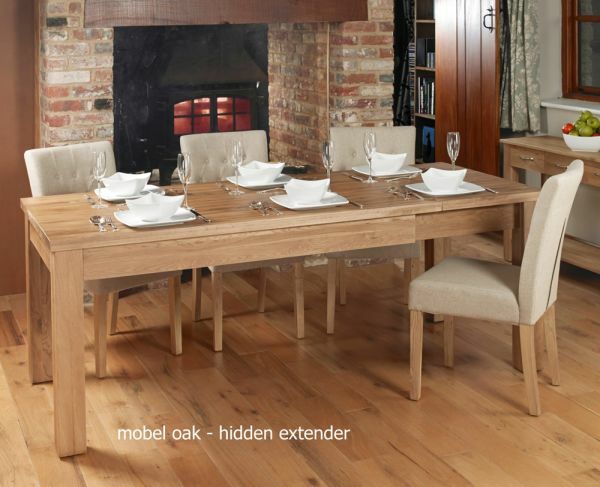 If you're looking for beautifully designed dining room sets, discover our best selling collections in Mobel Oak and Shiro Walnut. Browse our dining tables and chairs by range to see all of our options for creating a complete look and finish your dining space with a matching chic and practical sideboard perfect for storing tablewear and other essential Who needs restaurants when eating at home can be this stylish? From the table and chairs to the sideboard, you know that your furniture is made to the highest standard from The Wooden Furniture Store. 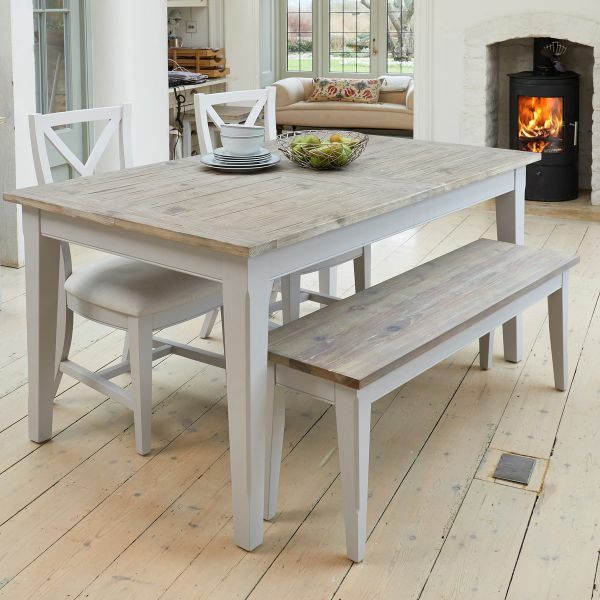 Our dining tables and chairs are made from solid wood and treated with a durable varnish to protect against everyday wear and tear. Every piece of furniture is designed to look perfect - as good as the day it was purchased and for years to come. Each order is delivered with care, direct to your door by our considerate logistics teams. If you are fortunate enough to have a room dedicated to the delights of entertaining and dining then you're going to need those all important extras such as sideboards, perhaps a bookcase, and maybe a corner cabinet. However, for many the dining space often needs to serve multiple purposes and if you have to double up your dining space as a home office, then you'll need to accomodate a computer desk and some wooden filing cabinets for storage, so be sure to plan your space carefully. 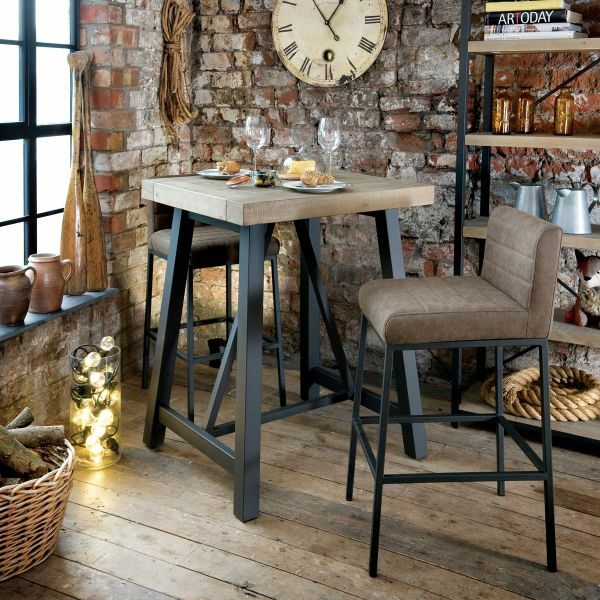 However you use your space, or whether the occasion is a simple supper or a feast for foodies, any item purchased from the Wooden Furniture Store is an investment of the highest quality, with many ranges guaranteed for five years.